Pumpkin Lasagna Cupcakes – layers of Golden Oreo, cream cheese, pumpkin and whipped cream with toasted nuts on top, all packed in individual portion of DELICIOUS and EASY, NO BAKE DESSERT! You all loved my Pumpkin Lasagna. I shared that recipe two years ago and it’s still one of the most popular recipes on my blog. And why it shouldn’t be?! Pumpkin Lasagna is so simple to make and it taste absolutely delicious!!! It’s layered dessert with cream cheese, pudding, pumpkin and spice, a lot of whipped cream and toasted pecans or walnuts. You don’t need a special reason or occasion for this yummy, light and creamy + easy to make dessert recipe!!! It’s enough that you’re a pumpkin lover and have a few simple ingredients on hand. You will spare less than 45 mins of your time and after a few hours of chilling you’ll get absolutely delicious fall dessert on your table. Although the recipe is really simple, this dessert is a perfect fit for holidays or special events. You can serve it for Halloween or after Thanksgiving dinner. Light dessert would be great after a huge meal. Today I decided to make a little twist with my old recipe. As I said, Pumpkin Lasagna is EASY RECIPE, but I thought it could be even simpler than that. If I make it completely NO BAKE and packed it in individual portion, you’ll have less dirty dishes and it would be easier to serve. You don’t need to worry about cutting and serving. Just arrange these delicious Pumpkin Lasagna Cupcakes onto serving plate and you’re done. You all like my idea of individual portion of PUMKIN PIE, too. In case you missed it make sure that you check my OMG Pumpkin Pie Cupcakes recipe. 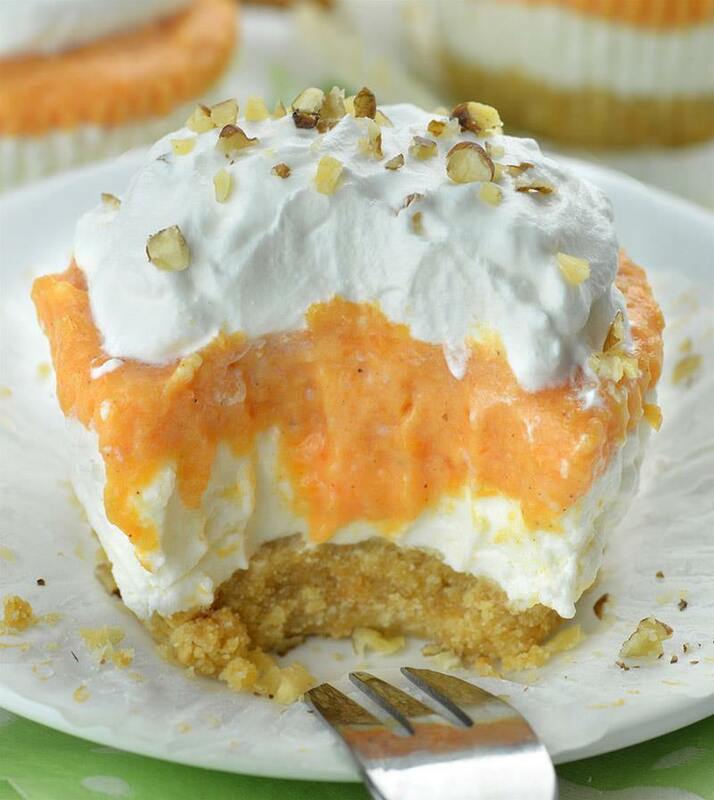 Let’s get back to today’s topic- Pumpkin Lasagna Cupcakes! I promise, it’s super simple and delish recipe! You’ll love every single layer. It start with everyone’s favorite cookies- Oreo. You’ll have to crush whole Golden Oreo cookies with the filling, stir with melted butter, divide the mixture and press it into the bottoms of cupcake liners. Next is cheesecake layer. It’s simple mixture of cream cheese, sugar and whipped cream, flavored with vanilla extract. Then comes the star of this dessert- pumpkin layer. For this layer you’ll need instant pudding mix of your choice. You can use vanilla or white chocolate. Prepare it with milk, stir to thicken, mix in pumpkin puree and spices: cinnamon and pumpkin pie spice. You can add a few drops of orange food coloring if you want to make it really festive. But the intense of color for this layer pretty much depends of pumpkin puree you use. I used my Homemade Pumpkin Puree and it was very intense in color so I didn’t have to add any artificial stuff. Top layer is just a simple whipped cream. Many of you don’t like when the recipe calls for Cool Whip, so you can use your homemade whipped cream and pile it high as much as you like. Enjoy this easy and delicious fall dessert!!! 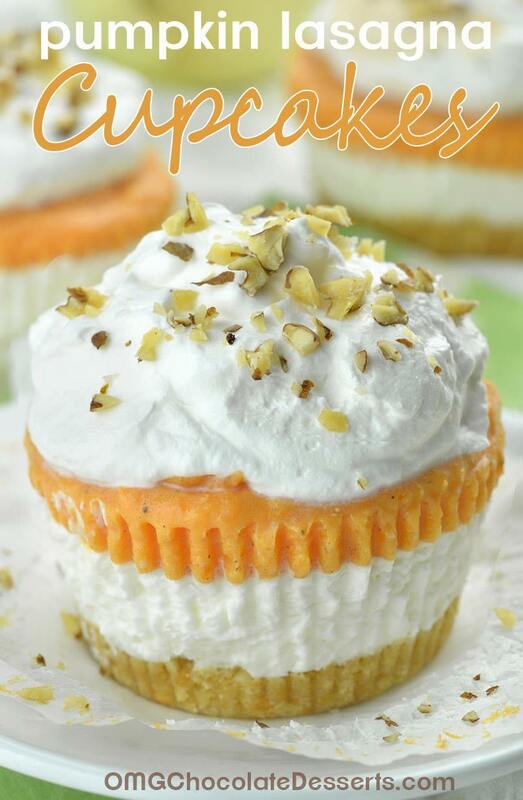 Pumpkin Lasagna Cupcakes – individual portion of DELICIOUS and EASY, NO BAKE PUMPKIN DESSERT! Notes: You should have enough of each mixture for 24 cupcakes, but I suggest you to start with 20-22 cupcakes and then divide remaining mixtures into 2-4 cups so you won’t end up short with some of the mixtures. Line standard cupcake pans with cupcake liners, set aside. Crush whole Oreo cookies with the filling in a food processor to make fine crumbs. In a bowl stir together Golden Oreo crumbs with melted butter and stir until evenly moist. Press 1 heaping tablespoon of mixture into the bottom of each cupcake liner and place in the fridge to firm while preparing the filling. To make cheesecake filling beat cream cheese until light and fluffy, mix in powdered sugar and vanilla until evenly combined. If it’s too thick you can add 1-2 Tbsp. milk. Stir in 1 cup whipped topping (Cool Whip or whipped cream). Spread 1 heaping Tbsp. of cheesecake mixture onto Oreo crust. Place back in the fridge. Whisk instant pudding mix with 1 ½ cups milk until thickened. Mix in pumpkin puree, cinnamon and pumpkin pie spice. You can add more spices if you like. Spoon the mixture over cheesecake filling and place in the fridge for a few hours to firm or set in the freezer for 30 mins. When cupcakes are set, arrange them onto serving plate, top with whipped cream and sprinkle with chopped toasted pecans or walnuts and serve. Can you make these the night before and chill overnight? Do you remove the cupcake liners before you serve them or let the guest do that??? Hi Dianna,you can make these ahead. You can serve it with or without paper liners. Can I make this two days ahead!?! Or do you think the bottom will get soggy!?! We are hosting a bridal shower, and with working full time during the day, we are trying to do as much as possible ahead of time! I am also making lemon-raspberry – first time ever in cupcake liners for individual servings – so I hope they turn out! The full pie recipe is a family favorite!! Still hunting for just the right chocolate cupcake pie recipe in liners recipe. Any ideas? Needs to be quick but set up and hold the cupcake liner sides up!